IT was billed as China’s Dubai: a cluster of sail-shaped skyscrapers on a man made island surrounded by tropical sea, the epitome of an unprecedented property boom that transformed skylines across the country. 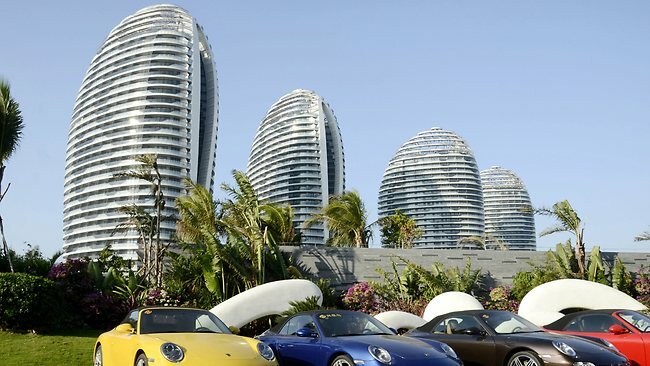 But prices on Phoenix Island, off the palm-tree lined streets of the resort city of Sanya, have plummeted in recent months, exposing the hidden fragilities of China’s growing but sometimes unbalanced economy. A "seven star" hotel is under construction on the wave-lapped oval, which the provincial tourism authority proclaims as a "fierce competitor" for the title of "eighth wonder of the modern world". But the island stands quiet aside from a few orange-jacketed cleaning staff, with undisturbed seaside swimming pools reflecting rows of pristine white towers, and a row of Porsches one of the few signs of habitation. "I just got a call from a businessman desperate to sell," Sun told AFP, brandishing his mobile phone as he whizzed over a bridge to the futuristic development on a electric golf cart. "Whether it’s toys or clothes, the export market is bad… property owners need capital quickly, and want to sell their apartments right away," he said. "They are really feeling the effect of the financial crisis." Official figures showed an almost eight per cent increase in China’s total exports last year, but sales to Europe fell by almost four percent with the continent mired in a debt crisis and recession. At the same time rising wages in China mean that producers of clothes, toys and other low-end goods are seeing their margins squeezed as other emerging economies compete to become the world’s centre for cheap manufacturing. For years Chinese business owners, faced with limited investment options and low returns from deposits in state-run banks, have used property as a store of value, pushing prices up even higher in the good times but creating the risk of a crash in the bad. "China had a lending boom… and so if people are using property as a place to stash their cash, they had more cash to stash," said Patrick Chanovec, a professor at Beijing’s Tsinghua university. "At some point they want to get their money out, then you find out if there are really people who are willing to pay those high prices." Phoenix Island is part of Hainan, a Belgium-sized province in the South China Sea that saw the biggest property price increases in China after a 2008 government stimulus flooded the economy with credit. Eager buyers camped out in tents on city streets as prices shot up by more than 50 per cent in one year. But tightened policies on access to credit and multiple house purchases have since knocked values in favoured second home locations, even while prices in major cities they have rallied in recent months. Real estate is a pillar of the Chinese economy, accounting for almost 14 per cent of GDP last year and supporting the massive construction sector, making policy makers anxious to avoid a major collapse of the property bubble. At the same time ordinary Chinese who cannot afford to buy a home have been frustrated by high housing costs for years. With anger over graft also mounting state media have carried several reports in recent weeks about corrupt officials’ property holdings, including a policeman who used a fake identity card to buy at least 192 dwellings. 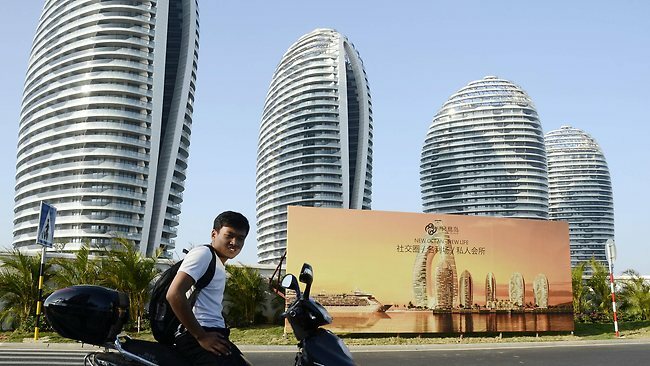 Hainan’s tropical shores are said to be a hotspot for purchases by well-connected bureaucrats, but estate agents denied they were rushing to sell off apartments for fear of a crackdown. Officials only account for around 20 per cent of owners, they said – while doubting any new regulations would be properly enforced. "There are always different rules for people with connections," said one agent, asking to remain anonymous. It is an example of the multiple competing interests the authorities have to balance, leaving them treading a difficult line, with sometimes unforeseen consequences. Yang Qiong has a thankless task as one of its saleswomen. "Before the government restrictions we would sell out a development like this in just five months," she lamented.